tradition of hand-painted glass ornaments. serious collectors. Click here to meet Abigail Peffer. 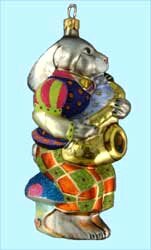 This musician is part of a group of really hip animals created as a blown glass ornament by American artist & designer, Abigail Pfeffer. Mouth blown and hand painted in Poland. 5 inches - 12,7 cm Abigail's Collection-Tannenbaum Treasures 2005 Introduction Sorry - Currently Out of Stock! Please check back later in 2019. 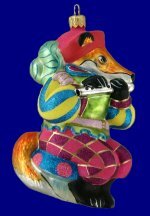 This musician is part of a group of really hip animals created as a blown glass ornament by American artist & designer, Abigail Pfeffer. Mouth blown and hand painted in Poland. 5-1/2 inches - 14,0 cm Abigail's Collection-Tannenbaum Treasures 2007 Introduction Sorry - Currently Out of Stock! Please check back later in 2019.